With the influx of students on campus, California Baptist University is sure to see an increase in pedestrians walking, longboarding and biking. 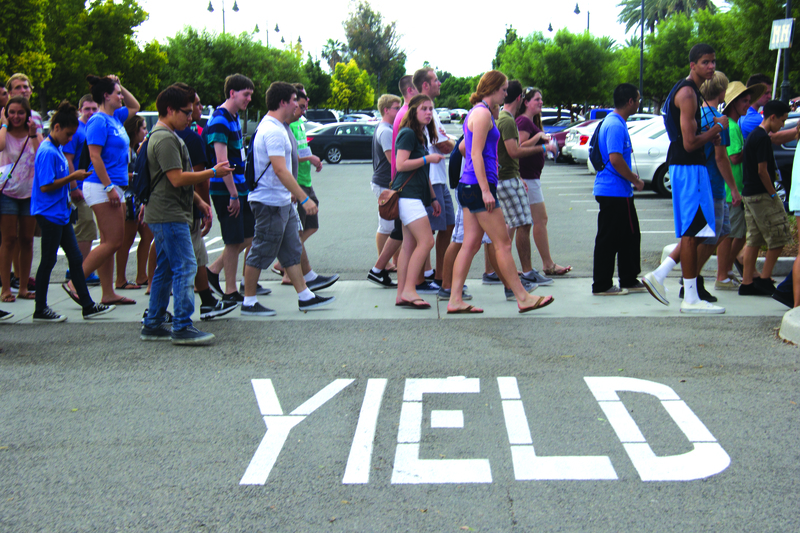 As the school year starts, pedestrian etiquette is something that becomes a hot topic on campus. Jim Walters, director of public safety, describes pedestrians as anyone on foot, longboard or bike. Whether it is pedestrians or cars, students feel the frustration on both sides. Contrary to Rios’ mindset on pedestrian etiquette, it varies between the pedestrian and the driver as to having the right away. Walters explains that often pedestrians are the ones at fault. Walters impresses that proper etiquette is caution on both sides: driver and pedestrian. However, this is often not the case. “I just walk in the intersection when it says to, regardless if anyone is driving,” Rios said. Skateboarders or longboarders are often the biggest causes of students’s frustrations. “I hate when they’re not on the crosswalk,” said Caleb Matt, junior intercultural studies major. Walters explains that long boarders are treated and held to the same expectations as pedestrians on foot. Regardless of whether students are in vehicles or walking across campus, Walters explains that the advice is the same for all.